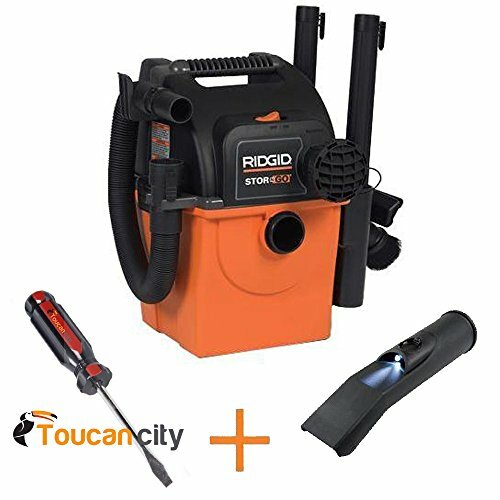 The RIDGID 5 gallon Stor-N-Go wet dry vac is a unique and innovative vacuum design. It mounts directly onto the wall, which saves floor space and alleviates clutter in your work area or garage. It is easily detached from its wall bracket, making it portable. For added convenience, store the hoses, cord and accessories on the Stor-N-Go caddy, which also detaches from the vacuum drum. Included with the accessories are one 2 to 7 ft. expandable hose and one 14 ft. Tug-A-Long hose. Hook both hoses together for 21 ft. of total reach. This RIDGID shop vac features a bonus lighted car nozzle, perfect for car vacuuming and deep crevice cleaning.